June 02, 1990, L. G. Crabo. 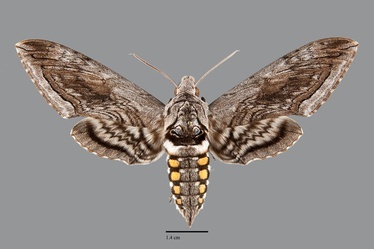 Manduca quinquemaculata is a very large sphinx moth (FW length 52–57 mm) with a complex pattern of wavy dark lines on a slightly brownish gray background on both wings. The forewing is elongate with a pointed apex and concave posterior margin. It is powdery gray at the base and costal margin, and in the terminal area except at the apex. The remainder of the central wing is streaked brown. The compound transverse lines are strongly streaked on the mid-wing; only the black lateral component of the subterminal line forms a somewhat straight edge. A pale gray line is present near the outer margin. The fringe is checkered brown and pale gray. The discal spot is small and is lost in the adjacent pattern. The much smaller hindwing is more contrastingly patterned. Most of it is warm brownish off-white with a pattern of multiple serrate black lines. The outer margin is even powdery gray, and the hindwing fringe is checkered black and white. The head and thorax are gray. Paired blue and black spots are present at the posterior thorax adjacent to black and white at the base of the abdomen. The dorsal abdomen has a series of black-rimmed yellow dots on both sides. A typical club-like antenna is present. The tongue is very long. This species can be identified by its very large size and yellow-spotted abdomen. It is only likely to be confused with Manduca sexta, a very rare migrant in our area. These species are differentiated by the posterior subterminal line. The line has a black nearly straight component in M. quinquemaculata, less distinct and entirely wavy in M. sexta. This species is widely distributed in the Pacific Northwest, particularly in lowland areas east of the Cascades in cultivated urban and agricultural habitats. It may not have been an established resident in the Pacific Northwest prior to the establishment of these anthropogenic habitats. This species is most commonly found in dry habitats east of the Cascades, often in areas near agriculture. It also occurs in the Willamette Valley of western Oregon. It is rare in British Columbia. 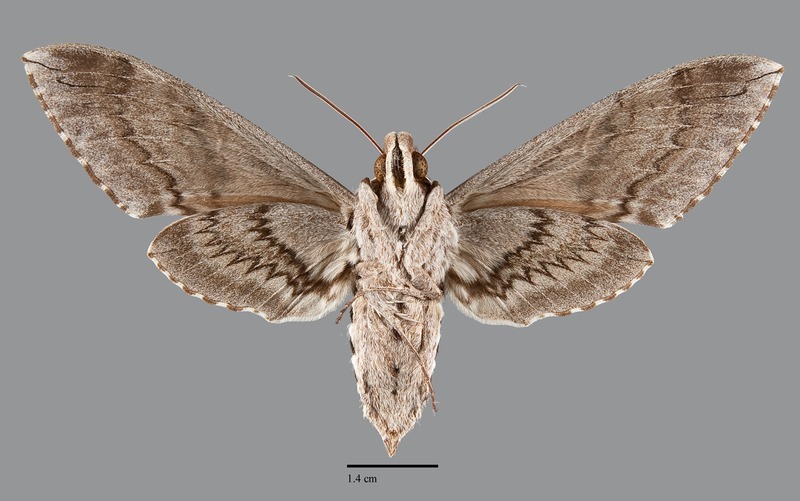 Manduca quinquemaculata is found throughout most of western North America, with exception of Wyoming and Montana. It is also widely distributed in the East, occurring north to southern Canada. This species is a foodplant specialist feeding on various members of the Solanaceae, particularly cultivated tomatoes and potatoes in agricultural areas and gardens. It may cause significant damage to local garden crops. Adults are on the wing from early June through late fall. They are nocturnal and come to lights. They feed while hovering in front of flowers. The longue tongue allows them to visit flowers with very long corollas. The larva is often a pest on tomato and tobacco, both in agricultural crops and in urban gardens.